SFTP, which stands for SSH File Transfer Protocol, or Secure File Transfer Protocol, is a protocol packaged with SSH that is a popular method of secure file transfer between two remote systems. ChronoSync v4.7 now has the capabilities to connect to an SFTP server. 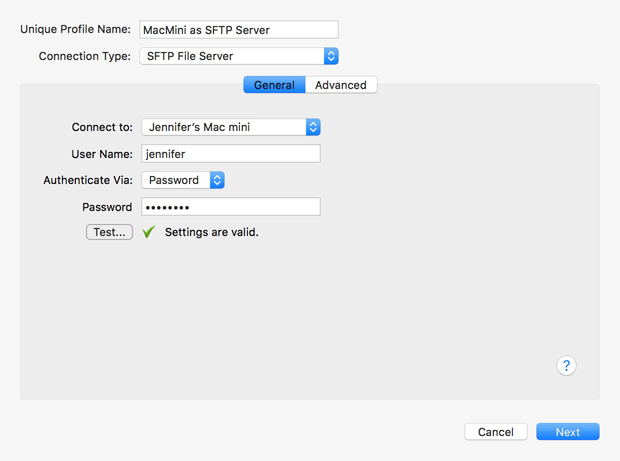 If you have a second Mac, you can set it up as an SFTP server. Otherwise, you will need access to some other type of SFTP server (e.g. Windows, Linux, web server, etc.). 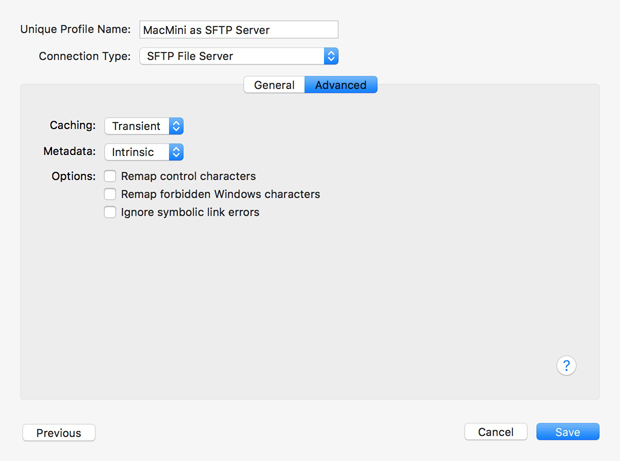 This guide will show you how to configure a second Mac as an SFTP Server and then connect and backup to it using ChronoSync. Note: Although this guide is about setting up and backing up to an SFTP server, we think if you are communicating with a Mac, ChronoAgent is a much better option than SFTP. In System Preferences open the "Sharing" panel. Click on the "Remote Login" service entry. Configure the "Allow access for" section to your desired access method. Turn on the "Remote Login" service. Once you have access to a SFTP server, you can configure ChronoSync to connect to it. Now that you have your other Mac as a SFTP server, you can move over to ChronoSync and set things up so you can begin backing up to it. Follow the steps below to set up a SFTP server connection profile. Click on the plus sign to add a new connection profile. Choose "SFTP File Server" for Connection Type. 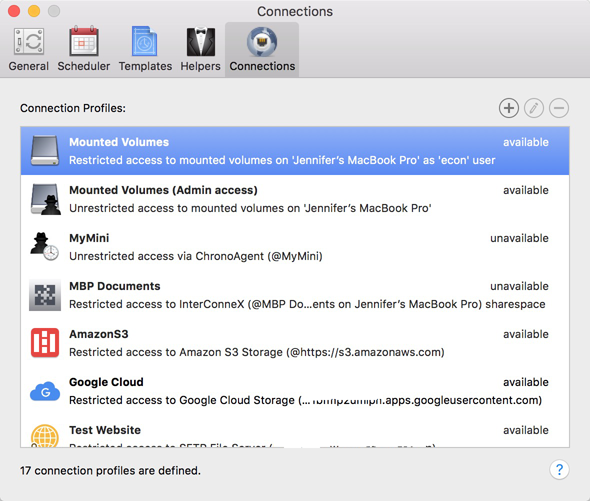 If you have set up a Mac as your SFTP server, and it is on the same network, then its computer name should automatically show up in the "Connect to" section as a separate entry. In which case, simply select that entry. Otherwise, you'll need to choose "Hostname or Address" and then specify the URL or IP address of your SFTP server. In "Authenticate Via", select the type of authentication that your SFTP server uses. Password -- Supply the name and password for an authorized user on your SFTP server. Interactive -- Supply the name for an authorized user on your SFTP server. Whenever you attempt to connect to the server you will be prompted to enter the password for the user. Public Key -- Supply the pathname to the public and private keys stored on your system, as well as the key password. 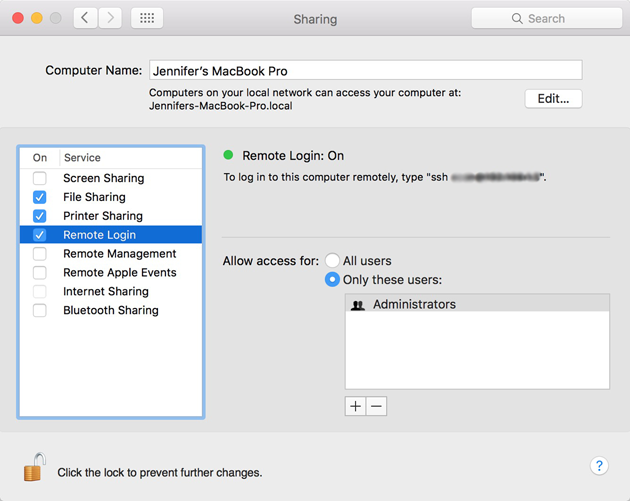 Consult this guide to see how to set up Macs for public-key authentication. If valid, click on "Next" to set up the Advanced connection profile features. Set whichever Advanced options you'd like. For a thorough explanation of them, click on the Help button to visit the ChronoSync help. When finished, click on "Save" to save the profile. Now you're ready to connect to it. Select your Source target by clicking on "Choose..." in the Setup panel's Source pane. On the Destination pane, choose the SFTP server connection you just created from the "Connect to:" menu. Click "Choose..." to select a folder from your SFTP server. Click on "Select" to close the sheet. At this point, your backup is ready to run. If you wish to set rules or options, visit the respective panel. Click the big right arrow in the middle of the Setup panel (or choose 'Synchronize' from the toolbar) to perform the backup. That's it! You have now backed up files to your SFTP server! Let's face it, some SFTP server implementations are better than others. Which means that you may encounter some limitations depending on the feature set provided by your SFTP server. Resource forks aren't preserved when syncing to an SFTP server. Symbolic links may, or may not, be supported. It will just depend on the SFTP server that you are connecting to. Even with the best of SFTP servers, only basic metadata, such as modification date and POSIX permissions, are preserved.